Are you looking for lightweight Syslog server to test your Fortinet®‘s firewall installation? or Is your firewall missing a local disk to save the logs? If your answer is ‘Yes’ to either question, then you may want to check out this Python script at GitHub. The script starts a syslog server on your local machine that you can point your Fortigate® to. 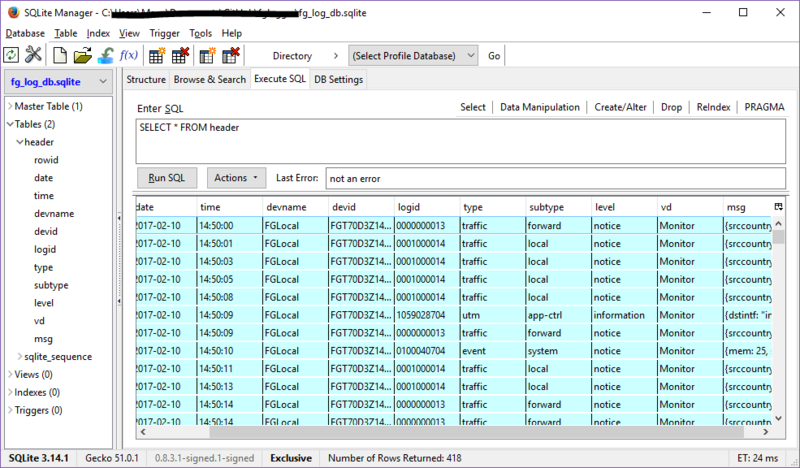 The script saves the logs into a SQLite database. Because Fortigate® logs are of several types and structures, the database table includes columns that correspond to the common (header) fields in the log message. The remaining fields are stored as text in the column ‘msg’ in the table. The script is provided under MIT licence, so feel free to use it as is or include it in your projects. Disclaimer: I have no affiliation with Fortinet. Fortinet® and FortiGate® are registered trademarks of Fortinet, Inc.